London does things big. Massive Ferris wheel. Giant gherkin. Overwhelming sense of inadequacy over a lost empire. 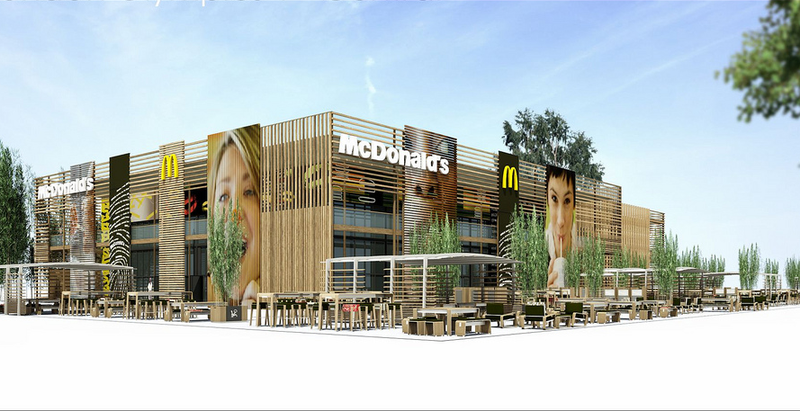 And this summer, the world's largest McDonald's will open up near the Olympic village, for six weeks only. The Olympics truly do bring out the best in the world. With 9,800 square feet over two floors, the pop-up McDonald's in East London will be able to seat 1,500 customers, and expects to sell 50,000 Big Macs and 180,000 orders of french fries once it opens in July. But the real story might be the competition for employment. Twelve thousand people applied to work at the giant McDonald's, taking part in "X Factor-style" auditions around the UK that judged them on "politeness and how well they flipped burgers." Citius, Altus, Delicious.